The AI technology Deep View, developed by ETRI, is applied to the precise recognition of human behavior based on analysis of joints of the human body in CCTV images. The technology precisely tracks movements of people placing down or throwing objects, as well as physical indications of such crimes as illegally throwing away garbage. Applying this technology in the future will proactively detect and prevent crimes and incidents in city areas. So far, there has been much difficulty in recognizing actions appearing in CCTVs, as studies on action comprehension used widely accessible online data such as YouTube videos. As part of efforts to resolve such difficulties, ETRI focused on developing action comprehension technology that can operate on the actual environment by pulling together necessary requirements and data with local governments. Using deep learning-based AI technology, ETRI developed a method to analyze the movements of human joints and moving objects. For example, it can detect patterns of garbage-dumping behaviors via machine learning methods. 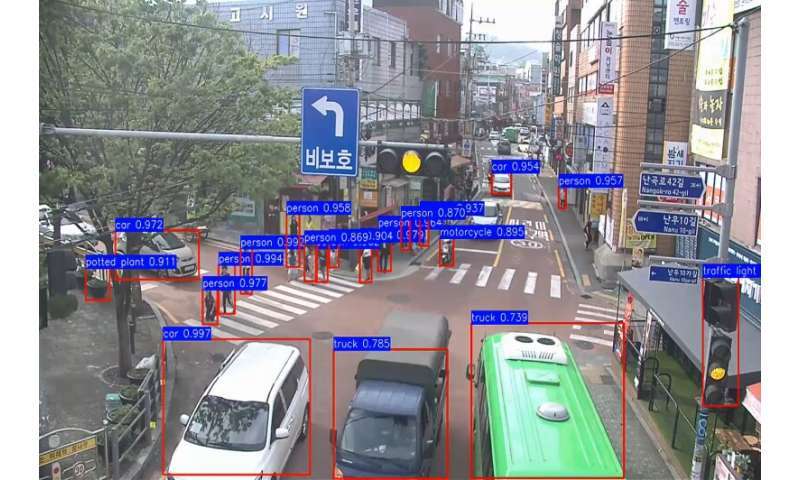 The research team used deep learning-based recognition technology to detect the locations of passersby, as well.